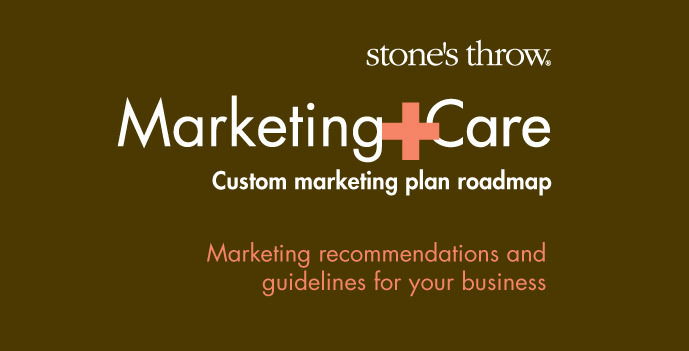 Leverage our customized marketing plan roadmap to get you started. Spend more time on what works and less time chasing white rabbits. MarketingCare provides smaller to mid-size organizations with insightful feedback and step-by-step recommendations for marketing with impact. Use the plan in whatever way works best for you. • Develop your marketing materials and promotional activities on your own. • Contract Stone’s Throw for the support and services you need to develop and execute one or all of our recommendations. On request, we will provide you with pricing for creative and other services at no obligation. We’ll provide the careful devotion to the details. For more than 20 years we’ve worked closely with clients in fields that range from professional services to education, and from biotechnology to healthcare. We understand the unique dynamics of working with smaller companies that have the ability to react quickly to shifts in market climate or sudden business development opportunities; you want to work with a team that will help you rise to the occasion. You also value a creative partner who provides checks and balances between planned activities and expectations. Contact us for information on our flat fee for the entrepreneur and small to mid-size businesses and organizations. Beyond a marketing plan, how can we partner with you to move your business forward? For a select number, Stone’s Throw provides virtual CMO support, functioning as the business’s marketing department. As a Chief Marketing Officer would, we initiate and guide marketing plan recommendations and develop communications strategies that align with the company’s overall growth objectives. As a marketing manager and department would, we also provide the creative services, design and copywriting, art direction, production and programming that bring the company’s marketing plan to life. From broad goal setting, to day-to-day marketing tasks, we work side-by-side with you to build forward momentum. It all starts with a plan, even if that means determining a few loose parameters now, and establishing more focused guidelines later. Over the course of nearly 25 years, we’ve had the privilege of working with many fine businesses and organizations. Those most successful at engaging their target audiences – and manifesting brand language that resonates with customers– have one important characteristic in common; they understand the power of planning. Strategic marketing communications for your business are just a stone’s throw away.